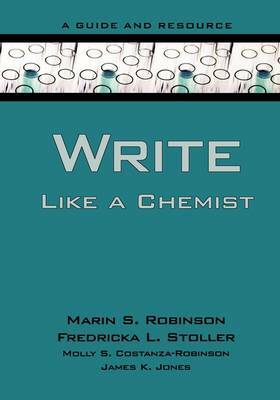 Write Like a Chemist is a unique guide to chemistry-specific writing. Written with National Science Foundation support and extensively piloted in chemistry courses nationwide, it offers a structured approach to writing that targets four important chemistry genres: the journal article, conference abstract, scientific poster, and research proposal. Chemistry students, post-docs, faculty, and other professionals interested in perfecting their disciplinary writing will find it an indispensable reference. Users of the book will learn to write through a host of exercises, ranging in difficulty from correcting single words and sentences to writing professional-quality papers, abstracts, posters, and proposals. The book's read-analyze-write approach teaches students to analyze what they read and then write, paying attention to audience, organization, writing conventions, grammar, and science content, thereby turning the complex process of writing into graduated, achievable tasks. Concise writing and organizational skills are stressed throughout, and "move structures" teach students conventional ways to present their stories of scientific discovery. This resource includes over 350 excerpts from ACS journal articles, ACS conference abstracts, and successful NSF CAREER proposals, excerpts that will serve as useful models of chemistry writing for years to come.